Healthy, strong, smooth and well-manicured fingernails add that additional glow to your overall health and beauty. You should not ignore dents in fingernails as they are manifestations of numerous health problems. Know the possible causes and remedies to get further understanding of this symptom. Dents in fingernails can be a sign of vitamin deficiency, especially of Vitamin B12. A diet that lacks in essential nutrients can lead to various nutritional deficiencies and dent in fingernails is a very frequent sign of these nutritional deficiencies. Dents in fingernails can also occur due to trauma to nails that may happen due to direct injury to the nails or nail biting. Psoriasis is a skin disorder that is characterized by development of plaques on skin. Apart from developing skin lesions, psoriasis can also result in development of dents in fingernails. Symptoms may also be triggered by ingesting large amounts of alcohol. Patients suffering from Reiter syndrome develop joint pain and swelling, and inflammation of eyes and urinary tract. Dent in fingernails may also occur in Reiter syndrome. The symptoms of Reiter syndrome are more severe in males in comparison to females. Alopecia areata is a skin condition in which patients lose their hair in patches, especially from their scalp. 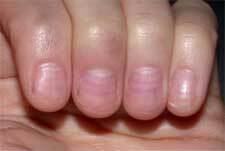 Dent in fingernails also occur in alopecia areata. Develop multiple nutritional deficiencies, one of which is deficiency of Vitamin B12 that may manifest itself as dents in fingernails. Hence, to cure your fingernails of these unsightly dents you should eat a well balanced diet that is rich in all the nutrients. Take vitamin supplements to treat the nutritional deficiencies that have been already created. Keep your fingernails clean and dry so as to avoid any type of infection. While you are using harsh chemicals or washing dishes, wear rubber gloves that are lined with cotton. You should regularly trim and file your fingernails. Moisturize your fingernails with a hand lotion regularly. Psoriasis is treated by applying various topical applications including tar preparations, anthralin cream, steroid cream, salicylic acid cream and Vitamin-D-like cream. Reiter syndrome is treated by prescribing various types of medications including antibiotics for infection, non steroidal inflammatory drugs for pain, and immunosuppressant, corticosteroids and tumor necrosis factor inhibitors for suppressing the immune system and controlling inflammation. Alopecia areata cannot be cured completely; however, with various treatment options, the hair can re-grow. Corticosteroids drugs are prescribed for autoimmune diseases to control inflammation. Another drug that is used as topical application is Rogaine or minoxidil.